Proven to safely and effectively remove all strains of skin tags, polypi, and skin tubercles including cutaneous papilloma, using exclusive plant extracts without the pain, scarring, or harsh treatments. Naturasil for Skin Tag Removal is proven to remove all strains of skin tags, polypi, and skin tubercles including cutaneous papilloma, using exclusive plant extracts without the pain, scarring, or harsh treatments found in many traditional methods. After spending years of research on homeopathic skin tag removal methods, we have developed an exclusive formula not found in any other product. The effectiveness of plant extracts are well known as they are used in 75% of all traditional pharmaceuticals world-wide. The topical application of these extracts are lipophilic and absorb into your skin and blood stream as soon as they are applied to your skin. This is the most effective gentle method for skin tag and polypi removal. Naturasil Researchers travel the world in search of certified plant extracts that are pesticide-free and are United States Pharmaceutical grade. Apply 3 times daily to the affected area. The skin tag will dry and flake away over a 3-6 week period. Consider taking an immune booster along with Naturasil for Skin Tag Removal, such as Naturasil Immune Renew. While it smells... pretty bad... IT WORKS. I only use at home, and once the oil it self has dried on your skin... the smell is gone. I have used this product for four weeks no. Most of the tags have reduced in size and color has changed. I only used twice per day because of the smell. Horrible smell. 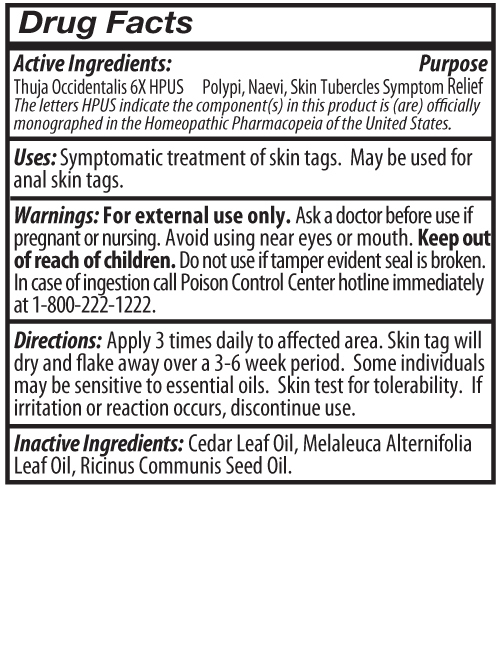 I have had neck skin tags for many years and saw this product advertised when I Googled in neck skin tags. I purchased the smallest bottle and applied it as directed. My skin tags started to change color, and I knew then that the product was working. After using the entire bottle I ordered a larger bottle and the skin tags are disappearing. You must be patient because they will not come off at once. Several of the smaller tags are gone and today the largest one came off. Use it as directed (three times a day) and you will be very happy with the results. I have six left and they are becoming flatter and flatter and are almost translucent. I will post another note when the remaining skin tags are removed. This is a very painless method of removing skin tags.